Are you planning to ‘Go Global’? Rapid Logistics and VAT & More helps you to get a solid grip on all European VAT obligations for your company. By deferment and recuperation of the VAT on imports, you can achieve considerable cash flow benefits. We can help you cut costs effectively, setting you on your way towards better financial results. We are working closely together with VAT and More for the VAT obligations in the European Union and can help you enhance to trade within the European Union. To continue to thrive as a business in the future, VAT and More must not only act as the customer’s VAT specialist. We also have to be a business partner in a broad perspective. 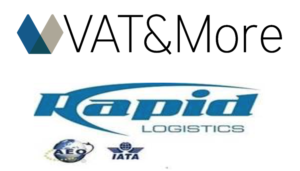 Therefore, VAT and More and Rapid Logistics do share the knowledge, our international network and business ideas in order to achieve growth together. VAT & More guides international operating companies through the VAT and customs legislation with our indirect tax consulting and VAT compliance services. By acting as a VAT agent, in a case of direct VAT registration, or as a general fiscal representative, we will have to understand our client’s business, processes, and challenges. VAT and More also offers ERP solutions to file VAT returns within Europe (VAT automation) and interim VAT management. VAT and More’s goal is to find a practical and compliant solution for your VAT and import duties challenges. VAT and More takes care of your VAT obligations in the EU as your VAT agent or fiscal representative. VAT and More can assist you on various matters of international trade as your local business partner.